USMNT player Ventura Alvarado played for one of the biggest clubs in North American soccer, Liga MX's Club America. That gave him ample experience in front of the big crowds at Estadio Azteca. Alvarado is already a two-time Liga MX winner, taking the 2013 Clausura and the 2014 Apertura with America along with the 2014-15 CONCACAF Champions League. In 2017, he moved to Santos Laguna for the Apertura season. He joined Necaxa for the 2018 Clausura. The Phoenix native chose the USMNT for his international allegiance, making his debut against Denmark on March 25, 2015. 2015: Debuted against Denmark on Mar 25 and quickly added to his caps numbers through two European swings. Played against the Netherlands on Jun 5 and Germany on Jun 10. Started for the USMNT in their 2015 Gold Cup opener against Honduras on Jul 7 and against Panama on Jul 13. 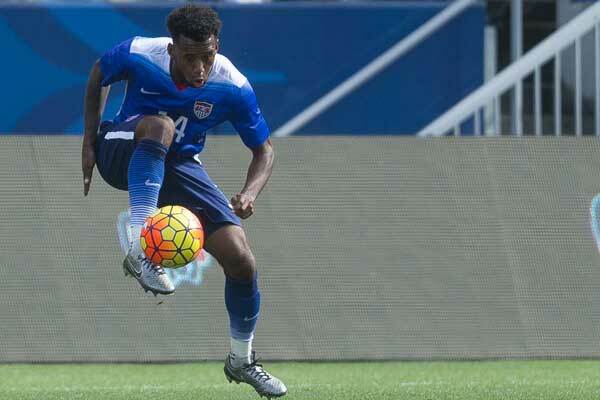 Started the Gold Cup quarterfinal against Cuba on Jul 18. Started the Gold Cup semifinal against Jamaica on Jul 22. Subbed on against Peru on Sep 4 and started the Sep 8 friendly against Brazil. Subbed on against Costa Rica on Oct 13. 2018-19: Finished 11th in the Clausura with Necaxa. 2017-18: Spent the 2017 Apertura with Santos Laguna, playing in five games and missing the playoffs. Joined Necaxa for the 2018 Clausura. Back with Club America for the 2017 Apertura, advancing to the semifinals. 2016-17: A member of Club America. 2015-16: Another CONCACAF Champions League title with Club America, finishing in 4th-place at the Club World Cup. 2014-15: Club America dominated the Apertura, winning the regular season title and the championship. Finished in 2nd-place in the Clausura, exiting the playoffs in the first round. Won the 2014-15 CONCACAF Champions League, beating the Montreal Impact over two legs in the final. 2013-14: Loaned to Necaxa in Mexico's second division. Made 21 appearances for the team, finishing in 2nd-place in the Apertura and losing in the final. Finished in 3rd-place in the Clausura, exiting the playoffs in the semifinals. 2012-13: After spending five years in Club America's youth program, Alvarado made his debut for the first team during the 2013 Clausura. Club America finished the regular season in 2nd-place, winning the championship with a playoff final victory over Monterrey. The LA Galaxy is actively addressing its biggest liability, with their defensive improvements already pushing them into contender status in the West. With New England playing the Red Bulls and NYCFC at DC United this weekend, we look at the I-95 rivalries in MLS with three clubs looking for turnarounds. The USMNT has a clear path to meet Mexico in the final of the 2019 Gold Cup, but that doesn’t make it an easy journey for the National Team.